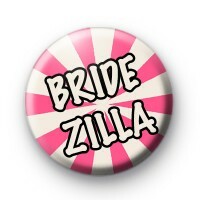 A super pink and cream coloured Bridezilla badge with black bubble text. If you are in the process of planning a wedding & have become a bit of a bride will this could be the perfect badge for you. Also fun to wear at your wedding reception. A super fun wedding badge which is also perfect for hen nights. 25mm badge made in our UK workshop. We have a huge range of Wedding badges available so do take a look at our wedding badge category.